Datainox provides a broad range of Data Conversion, Document Computerization and Digitization services across the globe. Document Conversion Service is among the many splits of Data Conversion Service that constitutes one of the major segments of services rendered by Datainox. The document can be converted in varied text formats. 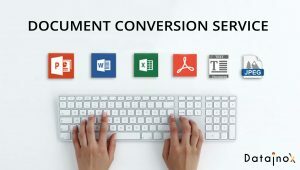 The document conversion supports converting text from/to XLS, XLSX, doc etc. DWG to JPG, PDF to DOC, DOC to TIFF, Excel to HTML, PSD to XHTML, TIFF to PDF. More conversion possible is GIF to TGA and PSP to PDF. Conversion of e-book is possible from EPUB to PDRF, HTML, PDF and MS Word. Can convert WPS to Word. Resume conversion in any desired format. Scanned images and text to Excel, PDF and XML, XHTML, MS Word etc. Data Evaluation – Depending on the client’s requirement, the given data is computed accordingly for suggesting the best output to the client. Each project is provided with customized assessment and client is suggested the most efficient and cost effective format for his business requirement. Data Conversion – Once the best format is evaluated for the client, accordingly the team commence with the conversion process. Most advanced software is used with profound knowledge on the in-use tools and techniques. Final Output – Once the conversion is done, the final output will be a simplified data that is easily utilized for the business requirements and will allow lesser time consuming for increased productivity too. Datainox team is always committed to give priority to Client Satisfaction. With a zealous team for each project, Datainox is always leading in providing the best quality work in minimal timeframe. Datainox will allocate each project head reporting to the authorized client representative too, along with the Operation Manager. This corroborates a smooth communication which in turn ensures optimum clarity whilst on-going work and minimizing oversights while also being paramount in Quality Check through multiple levels.